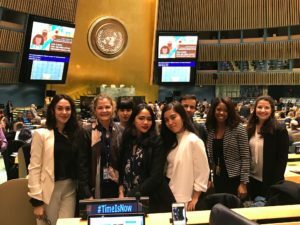 From March 12 to 24, Professor Anne Marie Goetz supported a small group of students to attend events linked to the 62nd meeting of the Commission on the Status of Women at the UN. The objective was to enable reporting on some of the themes discussed in this year’s meeting, as well as to report on changing political dynamics in the negotiations over the outcome documents. Two students – Aicha-Hanna Agrane and Aya Takeuchi — published articles linked to CSW in Open Democracy, accompanied with photos by another student, Noffar Gat. Professor Goetz also published an overview analysis of the shifting alliances amongst member states; both those in favor of progressive interpretations of women’s rights, and against. On March 13 2018, Professor Goetz moderated a full-day discussion amongst parliamentarians from around the world on the subject of the empowerment of rural women. 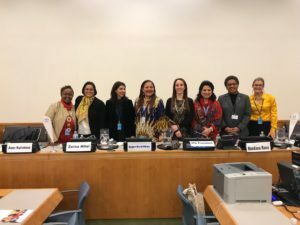 This was the theme of the 62nd meeting of the Commission at the Status of Women at the UN, and the parliamentarians had assembled to contribute to deliberations of the Inter-Parliamentary Union and UN Women on “Parliaments deliver for rural women and girls”. The meeting was opened by the President of the IPU, Gabriela Cuevas Barrón, who is the first woman and youngest person to hold this role, and Purna Sen, Policy Director of UN Women, as well as Margaret Natalie Mensah-Williams , the Chairperson of the National Council of Namibia and the President of the IPU Bureau of Women Parliamentarians. and a peer-reviewed research article, co-written with Rob Jenkins, in Development and Change, ‘Feminist Activism and the Politics of Reform: When and Why Do States Respond to Demands for Gender Equality Policies?’. 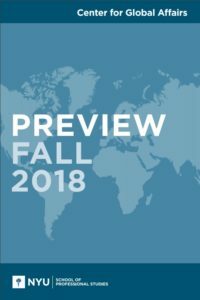 Adjunct Assistant Professor Josh Krasna has published a piece on “the State of the State in the Arab World and the West’s Arab Spring” in the Mediterranean Quarterly. This month, Professor Martin Smyth, adjunct instructor of analytic methods, was invited to participate in the annual Advanced Graduate Workshop in Computational Social Science at Santa Fe Institute in June 2018, the world-leading research center for complex system dynamics. On March 1, 2018, Professor Jennifer Trahan spoke to the Council on International Affairs of the Association of the Bar of the City of New York. Her remarks addressed: (1) the final negotiations to activate the jurisdiction of the International Criminal Court over the crime of aggression; and (2) the International Criminal Court’s inquiry as to crimes committed by US nationals in Afghanistan and related locations.